For every innocent man sent to prison, there is a guilty one left on the outside. He doesn’t understand how the police and prosecutors got the wrong man, and he certainly doesn’t care. He just can’t believe his good luck. Time passes and he realizes that the mistake will not be corrected: the authorities believe in their case and are determined to get a conviction. He may even watch the trial of the person wrongly accused of his crime. He is relieved when the verdict is guilty. He laughs when the police and prosecutors congratulate themselves. He is content to allow an innocent person to go to prison, to serve hard time, even to be executed. Travis Boyette is such a man. In 1998, in the small East Texas city of Sloan, he abducted, raped, and strangled a popular high school cheerleader. He buried her body so that it would never be found, then watched in amazement as police and prosecutors arrested and convicted Donté Drumm, a local football star, and marched him off to death row. Now nine years have passed. Travis has just been paroled in Kansas for a different crime; Donté is four days away from his execution. Travis suffers from an inoperable brain tumor. For the first time in his miserable life, he decides to do what’s right and confess. But how can a guilty man convince lawyers, judges, and politicians that they’re about to execute an innocent man? 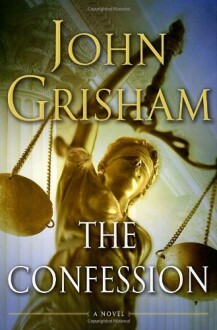 Not my favorite Grisham, but 4 stars; I really liked it. Texas, the death penalty, and an out of state minister caught up in trying to stop an execution. Beautifully written, but I hated the story. I wish I'd never read The Confession, but I couldn't put it down. I didn't mind the book length sermon, but that is just me. Characterization was so-so, but that's ok. I've been reading Grisham for 20 years so I guess I'm feeling a bit indulgent.